I love this show! December 2nd, 9 to 4. Laurelhurst Elementary School, 840 NE 41st. I have been a vendor at this show for a number of years and always look forward to it. Great variety of booths and a charming school as the setting. A student run bake table.....it doesn't get much better. Come start your holiday shopping. Hope to see you there. 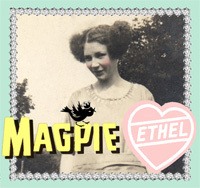 I will be surrounded by all my glitter and sparkle in my Magpie Ethel world. My blog is one poor neglected soul. I have basically transferred the majority of my vintage loving life over to Instagram. I just hit 10,000 posts today. Thats a big number. If you aren't on Instagram, I highly suggest it. It is a really fun community of people and a great way to connect with like minded people. Hope to see you there. It is never a holiday without an assortment of spun head friends! Some teeny Magpie Ethel ornaments. And an assortment of just fun holiday things. I have two sizes of Carmen Miranda fairies this year. Lots of goodies. Hope to see you there!